I got this as a sample from my friend who visited Nature Republic shop in Seoul. Snail's mucus extract in skincare is known for helping and improving in skin recovery, with anti wrinkle, and whitening effect. For trouble skin care like acne, managing skin irritations. Improve skin elasticity. Yes, all the goodness packed in a skincare product. How to Use: 1. After applying toner. Pull out mask sheet from package and unfold. 2. 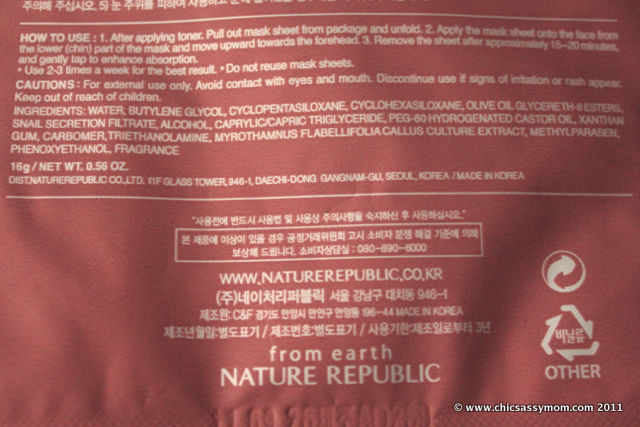 Apply the mask sheet onto the face. 3. Remove the sheet after 15-20 minutes, and gently tap to enhance absorption. Use 2 - 3 times a week for best result. 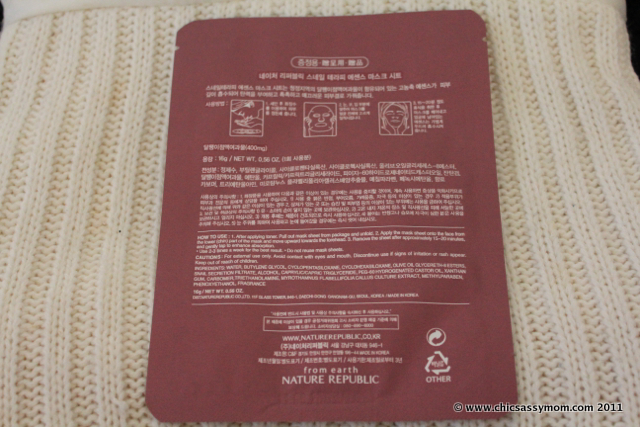 Do not reuse mask sheet. The mask sheet is by far the thinner that I tried. So I was extra careful when handling it. The essence is a bit on the watery side. But the mask itself is not soaking wet, so when I applied it there was little issue on dripping. Mask when laid flat. The mask was shaped in circle. I got a good fit, and it's surprisingly strong despite the thin material. Mask on. It's almost translucent. I left it for 20 minutes. I wanted to keep it longer but it's already drying out. I love the scent. It comes with a fresh crisp scent. I liked it. And it's not sticky at all, and there's a bit of cooling feel, while it's on, without any stinging feel. After removing the sheet, just when I was about to clean up, I noticed that there was actually more than a spoonful of essence left on the packet, (hmmm maybe that's why the mask sheet was not soaking wet...it's good to note to soak the sheet first next time! ), so I applied the essence all over, gently pat. And slept with the essence on. And woke up, with noticeable improved skin. I love how it's moisturizing without leaving a greasy feel. And that's a big plus for me. 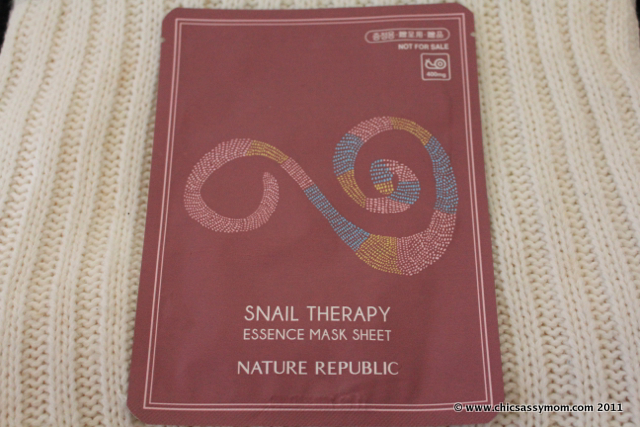 I just checked on the FB Page of Nature Republic Philippines that they'll actually be giving out a Snail Mask Sheet with JGS' face on it among several other freebies for tomorrow's SM North Edsa Opening. How nice?! Hmmm, should I drive myself to Manila? So tempting!